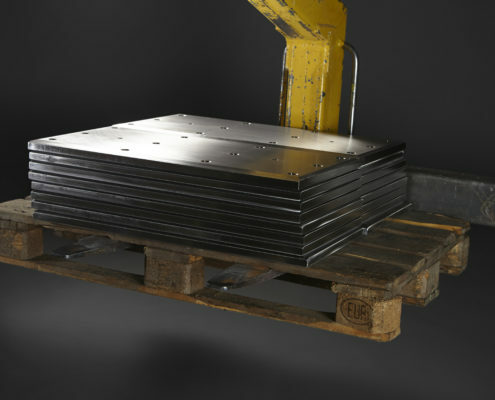 In comparison to regular wear parts made out of standard carbon steel, hardened tool steel, or bronze, the exclusive CORC®-g compound steel wear liners along with over 90 years of experience guarantee exceptionally less wear for longer lifetimes and protect the expensive references surfaces of the plant. That is the reason why a CORTS® compound steel liner or rail is not a wear part in the traditional sense but rather, a precision flat bearing. The initial cost of our gliding and sealing parts for sinter or pelletizing plants, and our precision flat bearings for rolling mills, are slightly higher then standard parts because of the complex manufacturing techniques and durability of the material. However, once a CORTS part is in use, reduced wear, maintenance cost, and eliminated shut downs generate long term cost savings. Linear bearing plates by CORTS are made from exclusive compound steel. With this material, the benefits of two different metals supplement each other: the hardened tool steel side makes up the corrosion protected bearing surface while the base material is soft and elastic. This unique material combination offers superior shock protection of the mounting surfaces and chocks while the hard layer tackles wear and corrosion. It requires complex methods to manufacture precision flat bearings made out of CORTS® compound steel, and thanks to over 90 years of in house experience, CORTS® offers unparalleled product quality and consistency.